Among US adults, 72% prefer to communicate with companies via email. Radicati estimates that the global email user base is 2.6 billion, of which Facebook has about two-thirds. Adobe found that we’re spending 17% more time with our inboxes this year than we did last year. When it comes to ensuring that the right people see the right content at the right moment, email wins hands down. According to Venture Beat, conversions have a 77% chance of rising for companies that adopt email automation. For these reasons, email marketing automation deserves a key role in your marketing automation strategy. When your business nurtures leads with triggered messaging, you will likely see an increase in average order value and a decrease in customer drop-offs. Let’s look at 17 automated email workflows that every business, including e-commerce stores, should set up and optimize to keep qualified leads engaged. When your audience or customers sign up for emails, they will likely read them. So, it makes sense that a welcome email sent immediately after signup will receive high engagement rates. One study shows that welcome emails received almost four times as many opens and five times as many clicks as regular promotional emails. Welcome emails generate, on average, 320% more revenue per email than regular promotional emails. Ask a question or direct them to a survey to learn more about them. Welcome emails have numerous uses. To help you decide on your welcome email’s content, simply think about what you want to accomplish next in the context of your overall business objectives. So, for example, if you have a long sales cycle, you could direct recipients to product info, related content, or an FAQ—anything that will increase their confidence in making a purchase. If your sales cycle is short, show the readers new products, promotions, or exciting content, quickly turning them into paying customers. For example, Social Animal, a content curation tool, sends out a very simple welcome email reminding users of what they can do with Social Animal’s content analysis. They also provide a personalized way to reach out to a co-founder for help. This type of email works well when the recipient has opted-in for a valuable resource or lead magnet that you offer. Based on the topic, you can tag the reader by interest and then send a series of emails to demonstrate your appreciation and enhance the customer experience—both essential for your success. A thank you and confirmation immediately after the opt-in for the download. You could also send selected tips, tactics, and related resources a few days later. A request for feedback several days after that. This will provide you with data to better prepare resources of value to your target audience. It also shows readers that you value their opinions as well as their business. If you are running a SaaS company, you know this is an important touch point with your potential customers. Those who sign up for a free trial of your product are good leads. After all, they have decided to give your product a go over your competitors. So, if you are not converting them, you have a problem. When users sign up, an automated email is sent to them. In most instances, the problem is that onboarding a user is overlooked or poorly done. So, users don’t find success with the product and fail to progress to be customers. On signing up to a free trial, most customers expect to receive an email and assistance with the product. So, your welcome email is likely to be well received even if you have in-app assistance as well. What makes for a good free trial email? Include your call-to-action to take the next step. 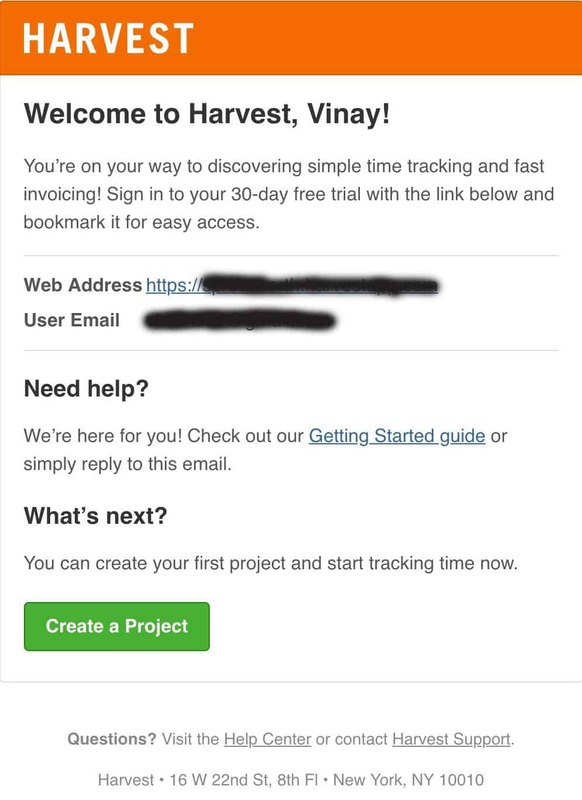 For example, Harvest sends out the following email when a recipient signs up. Most businesses will have a list of email addresses of those who have become disengaged because they haven’t used their product, made a purchase in a while, or left emails unopened. Offer subscribers a tangible incentive to engage more actively with your brand. Have signed up for a free trial of your software but haven’t been back to explore the program. 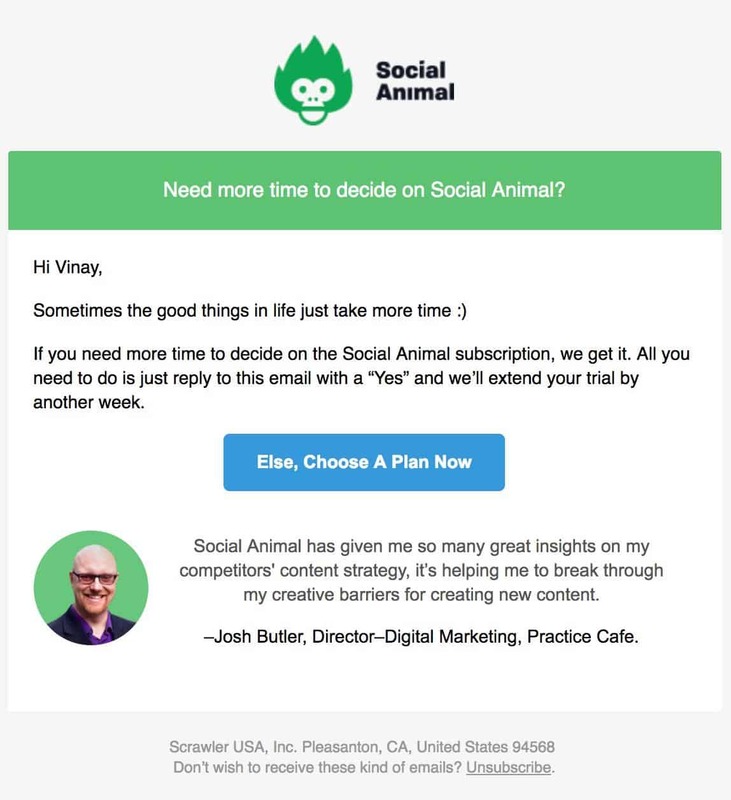 Social Animal, for example, sent me this email after my free trial had expired and I hadn’t selected one of their plans. Ever click away from a site’s shopping cart only to get an email reminding you to complete your purchase? These emails are money makers simply because they reach the right person at the right time with the right message. But the strategy doesn’t apply exclusively to e-commerce stores. The same happens to SaaS companies as well. A percentage of people will abandon their purchase, which is why it makes sense to have a system in place to follow up with lost leads. One of the best ways to recover lost leads is to get the user’s email address when they sign up for a free trial or when they add items to their cart. Add an authentic, positive user review. For example, Catch sent me this personalized email reminder a day after I had abandoned my shopping cart. Replenishment emails work well if you sell products with a limited lifecycle or that require regular service, such as filing tax returns or dental appointments. These are opportunities to connect with customers and give them a friendly reminder. Once the lifecycle of your product is complete, an automated email can remind customers to restock their product or, in the case of a service, to sign up for another appointment. Reordering consumable products like laundry detergent. Lead nurturing is a key part of email marketing automation workflows. It saves time and helps grow your customer base. Automation based on user actions or behaviors can make your messaging relevant and engaging. Depending on the action your customer takes on your site, you can send relevant automated emails at the right time. For example, say you run a sportswear e-commerce store and a customer looked at content around the time of a marathon. You can trigger an email based on their visits to specific URLs on your site. Knowing that they want to learn more about preparing for a marathon, you can send an automated email with related content and products. As the relationship grows, your brand will be foremost in their minds when they are ready to buy. LinkedIn, for example, sent me this email noting that I haven’t signed up for their learning services. When a user creates a website account/free trial account, there are usually several steps to complete their profile and get to the point where they see value in using the product. Although it seems to be a logical series of steps, it is often quite complex given the numerous demands on a user’s attention. Identify low-engagement users and those who have not properly set up their accounts for further outreach campaigns. For example, UberConference, an online conferencing tool, sends this email after a new user signs up for their service. Lead scoring can be time-consuming because it requires ensuring that your customers are the right fit and are interested in what you have to offer. Lead scoring can be used to segment lists for email marketing campaigns. I see you liked [insert amazing product]. What about [insert related product or what other people who bought an amazing product also bought]? This strategy works well for Amazon and helps to continue their relationship with their customers. It is also a profitable way to leverage data from your customers and to tailor their purchasing experience. eBay uses a similar strategy. 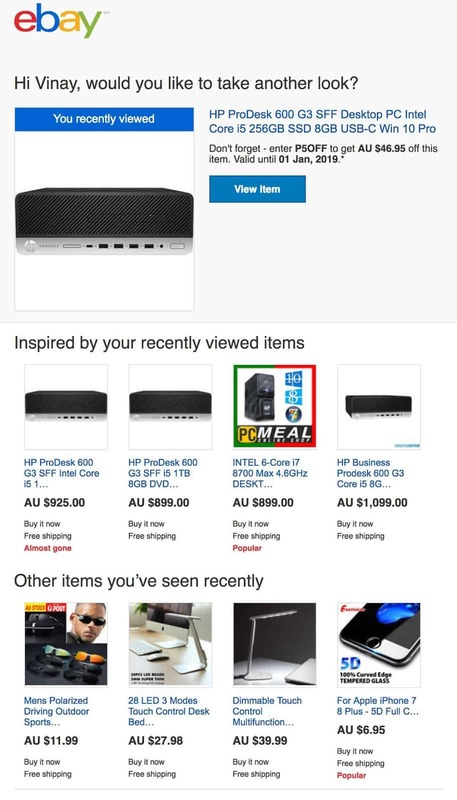 Noting that I looked at a couple of products, eBay sent me this email. Following up after a sale lets the customer know that you appreciate having their business and care about their satisfaction. For online purchases, following up is a great way to reach out with relevance and to increase your customer reviews. Include information like product care, product-use cases, or a product FAQ. I recently had to purchase a door and received this email asking for a review with a couple of specific details after the sale was complete. Email marketing automation workflows aren’t solely about making sales. Engagement and education are also key for nurturing and building trust with your audience. When you educate your audience, you help them understand the benefits of a solution. Chances are that your audience can find the information they need elsewhere, but when it comes from you, you help make them more knowledgeable and develop brand loyalty. Email marketing automation workflows can help create personalized experiences for each customer, making their overall buying journey relevant and engaging. For example, Mumsnet, a parenting site in the UK, understand that parenthood is a journey that begins with pregnancy. Share your due date and Mumsnet will send newsletters throughout your pregnancy, to help you through the stages based on how far along you are. An Australian internet service provider sends out emails (see below) that feature content related to upcoming events and themes while encouraging people to use their services. The very best SAAS companies keep monthly revenue churn at around 0.58%. That’s about 7% revenue churn a year. According to Totango, more than two-thirds of SAAS companies experience annual churn rates of 5% or higher. David Skok, a serial entrepreneur turned venture capitalist, says that if your Net Revenue Churn is high (above 2% per month), this indicates that something is wrong with your business and will become a major drag on growth. 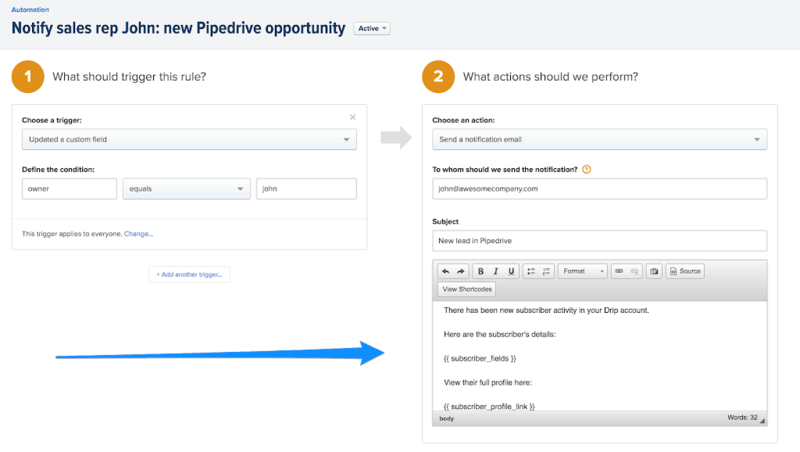 There are two ways in which email marketing automation workflows can be used to reduce churn. This can be done by using promotional emails offering special discounts or by an add value offer. It can also be done by educating a segment based on indicated interests or with feedback. The key to making this effective is to segment your list based on user responses or actions. Products often have multiple features, making it difficult for users to find those that provide the best value for them. One way to overcome this is to provide emails that introduce features based on user actions. For example, we know that adding a pop-up to a landing page can help reduce the number of visitors from bouncing with no engagement. So, when someone publishes their landing page, we can send an email with a CTA (call to action) to add an exit pop to the page. The best time to get in touch with a lead is when your marketing qualifies them. If they are not contacted while interested, they may lose interest or find another provider. Email automation can be harnessed to alert a sales rep that a lead has been qualified. Some email marketing systems will allow you to tag leads based on behaviours such as downloads, content consumed, or visited web pages. This way the rep has sufficient context to begin a conversation with the lead. For example, in Drip you can create relevant notification emails like the one below. Once you have onboarded a customer, your strategy needs to focus on keeping them engaged. According to Gallup, engaged customers bring a 23% increase in profitability, wallet share, revenue, and relationship growth compared to their disengaged peers. Keeping track of key customer success metrics provides you with a prime workflow opportunity. Customer advocates spend 5x more than other customers. For these reasons, it is no surprise that customer advocacy is considered a key differentiator among B2B companies. To implement this level of email marketing automation, you will need fairly advanced email marketing service providers that allow you to segment your subscriber lists and engage your customers at every stage of their buying journey. By using the right campaigns, your customers will move through the funnel, settle in as brand advocates, and contribute to customer success on a wider scale. Are you hosting an in-person or online event? You can use email marketing workflows to automate communication with your event registrants before, during, and even after the event. The Work by Design Summit is a virtual summit that sent out an email, similar to the one below, to those who signed up. Send a message from the hosts. In other instances, such as before events, you may want to deliver important information to those attending a live in-person event, such as hotel accommodation, agendas, etc. You may also need to send housekeeping reminders, session options, and details of networking opportunities during the event. After the event, you can set up a workflow that gives access to session slides and continues to nurture attendees via content and promotion for future events. A product launch email is sent to announce the launch of a new product, feature, release, or an upcoming event. Generally, product launch emails help create some hype and anticipation. Timing is a crucial part of a product launch and well-timed emails can play an influential part in this. It should provide answers, too. Apple, for example, sent this email about the new iPad Pro. The above email marketing automation workflow examples are a few ways in which this technology can grow your business. These workflows, however, do need to be part of a wider marketing strategy and shouldn’t operate in isolation. As your marketing automation strategy evolves, you will need to interconnect your workflows and ensure that they support the same overall goals, enabling a seamless transfer of data and automation to be targeted and effective. The EngageBay Resources Center is chock-full of helpful guides, like this one all about email marketing automation guide.